To get the trade nailed from trading binary options, investors use a wide range of techniques. It is often possible to meet traders who rely on simple luck, the gift of foresight or even fortune telling. But the bulk of professionals and successful traders for profitable trading apply the rules and tools of technical analysis. In general, market analysis and asset price movements are the main task of the investor in obtaining a profitable contract. Guessing and just guessing the movement of quotations of course you can get a certain percentage of the effective rates, but in the end you can not earn a stable income. Therefore, all traders without exception try to master technical analysis! In forecasting, there are several effective areas and approaches to market valuation that provide investors with certain trading regimes and form a variety of strategies. 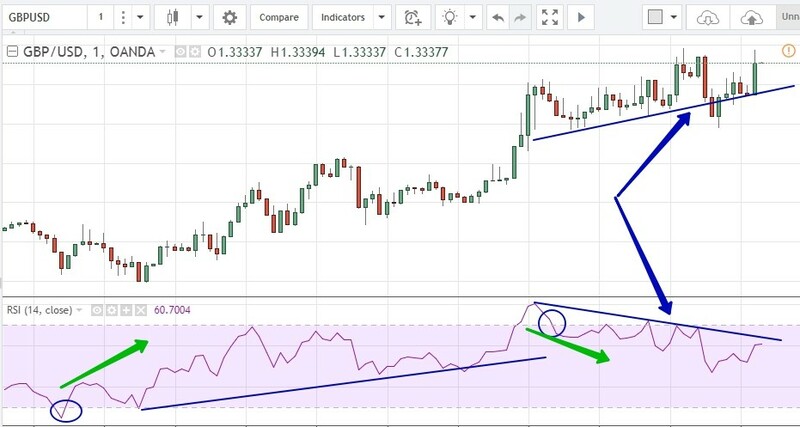 Today we will talk about such technical means as indicators and in particular oscillators, which, thanks to their algorithm of work and technical construction, are the best suited for trading options. So, first we will understand the definition. 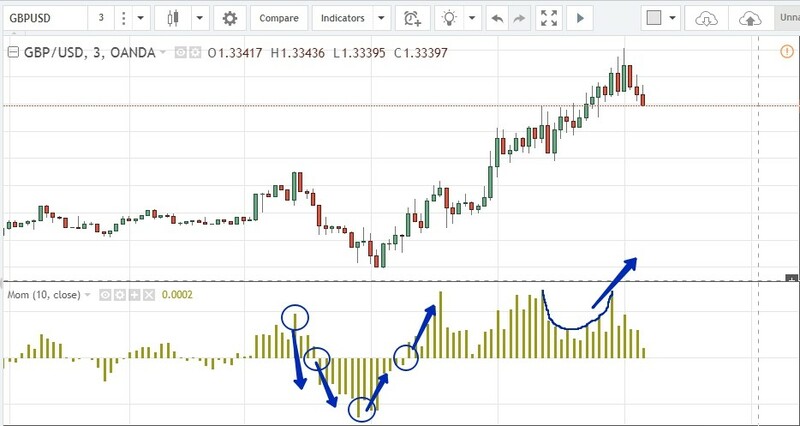 Oscillator is a technical tool of a graphic format with a certain algorithm for estimating market indicators, which is able to determine the cyclical (repetitive) moments of the movement of trading quotes. Often, the oscillators are called to determine the indicators of extremes of price fluctuations – the so-called zones or the points of oversold / overbought assets. 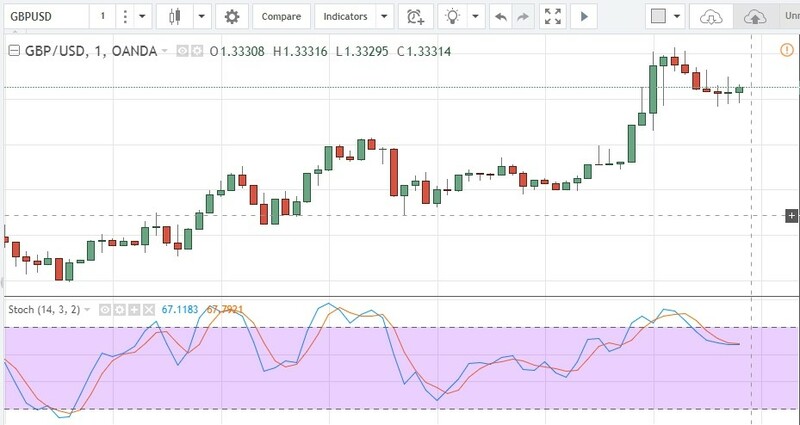 Display of these indicators is a very important technical information for processing trade contracts in the binary market. Today, traders are offered a fairly wide range of tools of this format. However, in the professional environment of investors there is a list of the most popular and efficient for trading services, which we will consider in detail today. This choice is due to a simple algorithm of the analysis tools, a clear identification of service signals, as well as a high level of performance of tool indicators in binary trading. Stochastic Oscillator is a service that is necessary to compare the price of an asset in certain market periods. The creator of the indicator is J. Lane, widely known in the circles of traders analyst and theorist of technical analysis. Oscillator in the classical mode of use is a service located directly under the asset schedule in an additional window. It consists of two medium lines, which assess the medium and short-term market ranges. In addition, the technical algorithm of the indicator includes two levels – 80 and 30. These technical zones reflect the extremes of the market, of which we spoke above. Overbought is characterized by rapid growth of quotations in a narrow time range, which allows traders to determine the possible levels of the reversal of quotations. In turn, oversold is a rapid drop in the price of the asset, which is also a signal for the subsequent reversal of the trend. Working on a binary market with the Stochastic oscillator allows you to get the effectiveness of trading at a level of at least 80% of the profit rates. 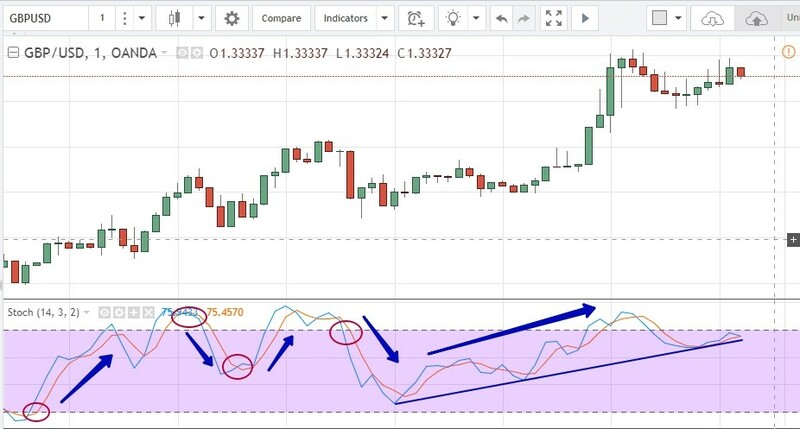 It should be noted that Stochastic has many formats of work and is the foundation for the development and construction of custom forecasting tools, other indicators, as well as strategies for high-performance trading. When analyzing the work of RSI, it is necessary to disclose some negative aspects of its application. Here it is worth saying that the service is often late with the assessment of market indicators at the time of impulse increase in volatility of quotations. In addition, very often the indicator can stay for a long time in the extremum zones, which complicates the work of the investor in periods of building protracted trend movements of the market. But in general, the standard strategy on the RSI indicator is able to bring the trader up to 85% of the effective rates. MACD has more than thirty years of history – the indicator was released in 1979, its developer was the famous financial guru Gerald Appel. The technical tool uses a rather complex algorithm for constructing and evaluating the market, which is based on the use of several moving averages and a two-level system for smoothing signals. 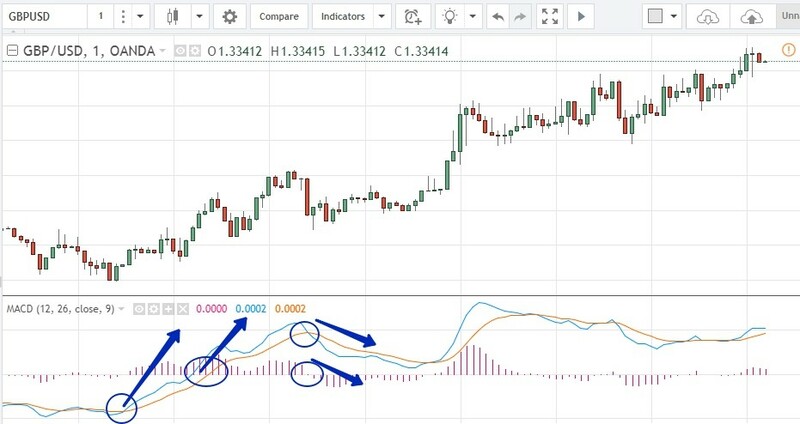 The principle of the MACD indicator is based on the use of an oscillator in the form of two different period moving moving average removals and a histogram that indicates the degree of divergence of the oscillator lines, which indicates the strength of the trend movement. It should be said that this resource is included as the main indicator of analysis in the maximum number of trading terminals for trading. For example, the European options brokers already, when developing a trading terminal, included MACD in the list of services of its indicator set, thus creating good technical conditions for the effective work of its investors. • Trade at the intersection of the oscillator lines with each other – this mode of using the analysis tool is usually used in scalping with binary options. The signal in the form of the intersection of a fast MA moving with a medium-term MA allows you to work in a dynamic trading format on short-term chart timeframes – from 5 seconds to 1 minute. So the trader can get indicators of profitable statistics at the level of 85% of the effective rates. Thus, the variety of signals of the MACD indicator gives investors the most ample opportunities in professional activity, which makes it possible to systematically obtain a high profit. In addition to the classic methods of working with MACD, traders often use this indicator as technical filters in multi-indicator strategies. In this way, the maximum accuracy of the strategy’s forecasts and the performance of investors in binary trading is achieved. This oscillator tool refers to the type of advanced indicators. That is, the service does not really display the current smoothed market indicators, on the basis of which it is possible to generate a trading signal, but directly the possible development of events on the asset chart. This undoubtedly consists in the attractiveness of the tool for traders of binary options. 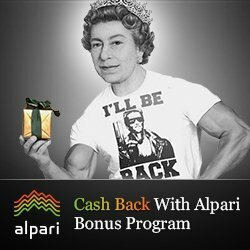 The direct work of the service is based on the calculation of the difference between the levels of the maximum and minimum of the first and last candles of the asset schedule in the schedule period set during the settings. Here it is necessary to say that the indicator has several variants of technical algorithms – often a simpler mode of calculation of indicators is used – the ratio of the current value of an asset to the indicator of the graph for a certain number of periods back. In addition, in some platforms, in calculating indicator indicators, not only technical indicators of the value of an asset at a certain moment of market movement and their ratio are taken into account, but also statistical indicators are used in the form of trade volumes and the number of contracts issued on the market. Therefore, sometimes a service is called a volume indicator. If you analyze the signal system and the direct operation of the indicator, then it is not entirely correct to call it an oscillator in its pure form. But its cyclical signals and a list of calculation indicators give traders the right to attribute the resource for technical analysis to the oscillator type of indicators. When building strategies, this technical service is used mainly as a leading indicator and a highly efficient service for filtering trading signals. Its work allows investors of the binary market to receive more than 80% of the profit rates. We offered only a small list of standard oscillators that can be effectively used in trading options. Their technological algorithms for building and quick reaction to changes in market indicators are very useful in conducting market analysis and in the formation of trade forecasts. Of course, the list of oscillators has hundreds of names today, but even this set of analysis tools in the trader’s arsenal is sufficient for productive trade in the market. ← Why you need to become a trader? – Is it worth?